In February 2011, I was all snuggled up under the hood of a vehicle just trying to keep warm. Well, you probably know what happened when the owner of the vehicle started the engine. Most of the next few months is a blur, as I endured a rear leg amputation and a very aggressive staph infection that cost me the remainder of my leg and some of my hip bone. I wore pain patches for a very long time just to get through the recovery ordeal. I was placed into foster care with Jennifer at Feline Friends for my final recovery and rehabilitation with hopes that someday I would find a home of my own again. Jennifer had her hands full with me. I was cranky and too discouraged to even try walking again, but Jennifer put a strap around my belly and taught me to balance and hop along on that remaining back leg. Soon I was ready to make the weekly trip to Feline Friends and join the others waiting for a new home. On June 11th, my new owner arrived at Feline Friends. She looked at every cat there, and even old Colgate next door, but she came back to me! I was still cranky and a bit hissy at this point, but I was the best fit for the two cats waiting for me at my new home. After a couple weeks of hissing and sulking in my private room, I finally decided it was time to come out and join the rest of my new family. My feline companions welcomed me with open arms, and really wanted to take care of me, but I was still crabby, trying to learn to walk, and felt vulnerable. Note* The real reason I wanted out of the room was to spend more time with my new owner, not cuddle with the other two cats. 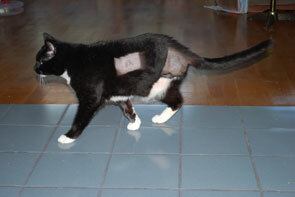 The cats kept their distance, as I learned to walk again, and now I am strong enough to jump on the bed and chairs. My new owner has placed chairs in other locations for me so I can get up on the dresser and other places I want to be for a view of the outdoors. Right from the start the little Aby (Buttons) kept insisting I play. Even when I hiss at her she still insists that we are playing. That girl never gives up, and finally broke me down. Now I play all the time! It has been one year since my adoption, and I now have the upper body strength of a wheelchair racer. 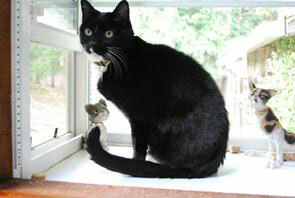 I love spending time in my owners lap, napping in the sun, and sitting in my favorite window watching the outdoors. I did ask to go out a few times, but apparently that is not allowed in this household, so have given up on that. It was tough getting used to the food here in the beginning. Fresh cooked salmon for breakfast and prepared beef for dinner! I do like the beef, but not really into salmon that much, so I opt for the dry food at breakfast. Buttons says it was because I must have been a “slum” cat before the accident. Who knows….maybe I was….can’t remember back that far anymore. I love my new life, and my family. 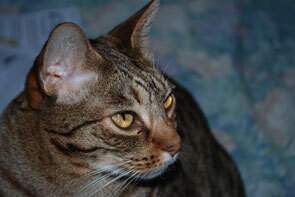 I would not be here if it wasn’t for the help the great people at Steamboat Animal Hospital and Feline Friends. Thank you so much Jennifer for insisting I learn to walk and giving me the courage to at least try. I could not have done it without you! Come visit me someday Jennifer, so I can show off my new family and new mobility skills. I am not that far away, just down the road 8 miles. Also, I am forever grateful to all who donate to support the work of Feline Friends!